A page from “Norman Rockwell: Behind the Camera”. SEEING DOUBLE: Chronicler of midcentury Americana Norman Rockwell often recruited friends and neighbors to pose for the photos that he then used to create the iconic images we know and love. 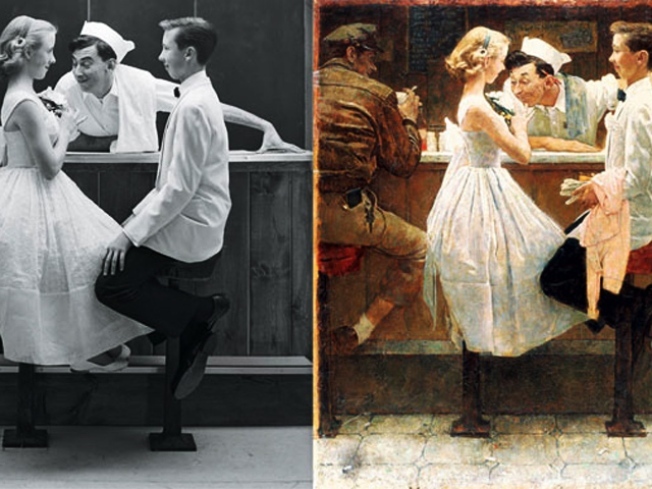 Until now, that part of the painter’s process remained mostly hidden, but historian Ron Schick’s new book “Norman Rockwell: Behind the Camera”(Little, Brown; $40) reveals the primary texts next to the colorful classics they became, and the result is truly impossible to put down. Shakespeare & Co. Booksellers; 716 Broadway; 212-529-1330. STOCK STUFFER: Women’s and men’s apparel samples and stock pieces from are slashed to 70-85% off retail at ThePrive’s Elie Tahari warehouse sale at Chelsea Market. If we know Elie Tahari, your hunt for the official LBD (little black dress) of Holidays ’09 ends here. November 11 through 15. 75 Ninth Avenue; 212-243-6005. THE GIRLIE SHOW: While you have your credit card at the ready, nip up to the Shoshanna Showroom Fall Sample Sale, where dresses that would run you $350 at Bloomies or Saks are slashed to $150, and they’re shaving up to 75% off swimwear and denim. Lots of deals under $100. 231 West 39th Street. 212-719-3601.